On the eve of the start of early voting in Florida’s primary elections, the Capital City GLBTA Democratic Caucus, a chartered chapter of the Florida GLBT Democratic Caucus, announced that they have endorsed Nancy Miller, candidate for re-election to Tallahassee City Commission, Seat 3, and Verna Brock, candidate for Wakulla County School Board, District 1. While the Capital City GLBTA Democratic Caucus does not endorse in primary races that involve more than one Democratic candidate, the organization has issued statements of support for Mayor of Tallahassee candidate Andrew Gillum and Tallahassee City Commission, Seat 2 candidate Curtis Richardson. 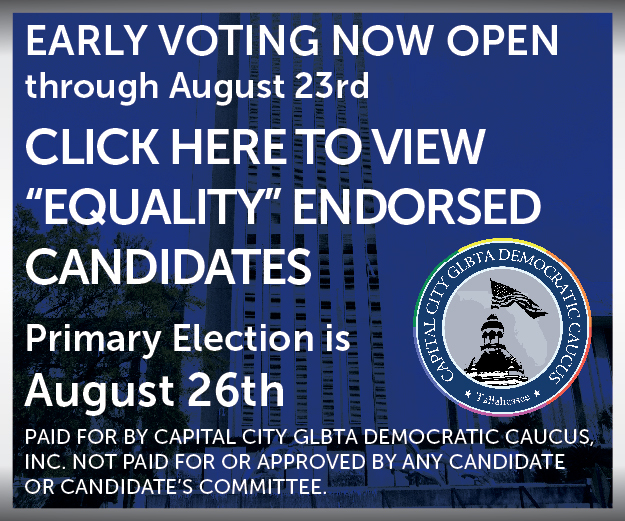 The mission of the Capital City GLBTA Democratic Caucus is to foster good will between gay, lesbian, bisexual, transgender and ally (GLBTA) members of the Democratic Party and the community at large. The organization seeks individual freedom in the framework of a just society and political freedom in the framework of meaningful participation by all citizens. For more information about the organization, visit www.ccglbtdems.org. For a full list of endorsed and supported candidates, visit our Endorsements page.